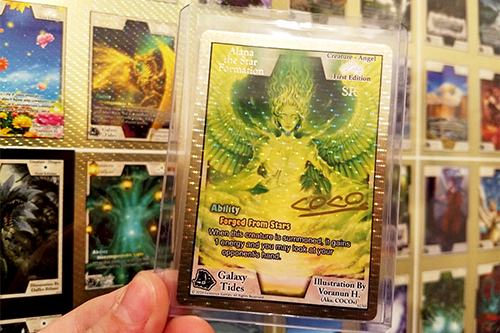 Exodus News - Want an Artist-Signed SR Alana? Would You Like a SIGNED Secret Rare Alana? Who wouldn't--right?! It's only the most sought-after and rare card in the Galaxy Tides booster set! And to add the artist signature on top? Practically priceless. Currently, only about 3 signed SR "Alana the Star Formation" cards have ever been put into circulation ... but something's about to change that. We're offering a limited quantity special JUST for you awesome Newsletter subscribers (the outside world, A.K.A. non-subscribers, don't know about this)! So if you've been looking or waiting for a great promotion or deal on your next Exodus purchase, this is it--we've got you covered here. We want to get a great deal in YOUR hands and have you feeling like Eeventide's most spoiled and valuable Drifter, because when our players are happy, we are too :) It's always been and always will be our passion to go above and beyond in our delivery and get the best possible value to you--our cherished player! • With the purchase of 1 Galaxy Tides booster case, you'll receive not one, but TWO SR "Alana the Star Formation" cards (one of which will be signed by the artist herself, COCOs)! Additionally, you'll get an official Uncut Sheet signed by the game creators! • IMPORTANT: The first 10 people to reply to this email will receive a private link to claim the offer. • A 5% discount comes with this sweet deal, bringing the normal $503.88 price tag down to $478.69, but we'll round it down to an even $475 (and shipping is free, on us)! • Limit of 2 purchases per person for a possible 2 different uncut sheets (Galaxy Tides sheet & Crystal Forge Sheet) and 2 artist-signed SR Alana cards. - If $475 seems like a lot to dish out at once (don't turn the other way just yet), let's break it down so you can see exactly what you're getting. For what you pay, you get 12 sealed booster boxes, each of which contains 12 packs +2 box toppers (and every booster pack has 5 random cards). That's a whopping total of 744 cards for your collection! - A booster case already guarantees 1 SR "Alana the Star Formation", but with this offer, we're including a SECOND copy for FREE that also boasts the artist's signature. - We've never made a discount like this before (5% off + AWESOME bonus items that we don't normally give away). This exclusive booster case deal probably won't be coming around again, so this is your opportunity to get the snag of the year from us! - Finally, as with all Exodus TCG cards, every card you get in this purchase will have lasting value, as we're committed to never reprinting cards in future sets or implementing ban lists. You have our 100% guarantee that the cards you buy will be just as playable 5-10 years down the road! Don't quite have the cash? Split the cost with a friend and crack open a case together! Gaming is all about community, isn't it? Ready to be one of 10 lucky people to get spoiled by this deal? Click Reply on this email and tell us you'd like to get our SR Alana offer, and we'll personally answer back with an exclusive link to the purchase. Only the first 10 sales will receive the deal though, so we encourage you not to hesitate! Thank you for your continued support and love of the game, valued Exodus player :) We couldn't get this far without you!